This past week I published another of my short stories entitled The Interview. The short teaser? You can find The Interview at the following links: Amazon, Barnes and Noble, Smashwords. It’s a little bit of a departure from my normal stuff, but I’d love to hear your thoughts. Also, I must give thanks to fellow writer/blogger/Triberr mate JW Manus. In addition to many great things she has to say, she has put together a couple of concise posts on getting your Word documents formatted for e-conversion. Previous to settling down with my wife, I spent a couple of years on various travels. From Hawaii to Canada to Mexico (and most of the continental United States). Granted, not too terribly exotic, but I had some interesting experiences. Next Friday, I’ll share one of those from my time in Mexico. 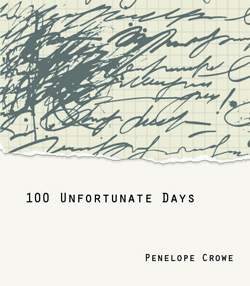 If you haven’t read my past last week, a review of Penelope Crowe’s 100 Unfortunate Days, I would hope you would take the time to do so after reading this interview. Penelope is a Triberr mate of mine (along with four other great writers you can find out about at my friend Jonathan Allen’s post The #TESSpecFic Weekly. Party time. Excellent.) . While other Triberr mate JW Manus doesn’t hesitate to fly in the face of convention, Penelope doesn’t hesitate to ask the questions many of us are often afraid to ask (at least aloud). And when she’s not doing that, she’s writing children’s stories. An interesting woman indeed. A combination of all of the above and more. In fifth grade I had a little red notebook with a smiley face on it that I wrote in every day. I wrote about all the kids in the class—nice, not nice, mean, etc. I was out sick and came back to find my notebook had been molested, and everyone had commented right back. I knew from then on that words had quite a bit of power. I was a power-hungry fifth grader. I went on to do a comic, and a bit of editing for the school newspaper. I was not a good editor then, and am not a good editor now. This has never left me. I re-read Salem’s Lot, and tried to re-read Ghost Story by Peter Straub—both for a book club I am in. I loved them both the first time. Salem’s not was not as scary as I remember and I could not finish Ghost Story. I am reading Incubus by Ann Arensburg, Dracula by Bram Stoker, The Art of Tim Burton, Free Five by Paul Dail, If You Go Into the Woods by David Gaughran, Dark Jar by Bruce Memblatt and several others. I almost always read several books at the same time. In the past it was one book in the car (while waiting, not driving), one book on the nightstand, one book in the living room…you get the picture. Now it is even easier to hyper-read because I have a Kindle and a Nook—and I looove indie author giveaways. I have discovered so many wonderful stories and authors this way. Francine woke up to find a six foot tall chocolate bunny in her room with eyes the size of baseballs. Was this the work of the Easter bunny, or an escaped spy robot? Francine loved candy more than anything in the world. She made an impossible mega-candy wish that could only come true in her dreams, then woke up on Easter morning to find it had come true! Was this the work of the Easter bunny, or had Easter been taken over by a Super Spy Bunny!! I have had over 20 jobs—everything from makeup artist for Sony Studios in New Jersey to vice president of sales in an outsourcing organization in the 90s. And I do not like ice cream. 7- In 100 Unfortunate Days, among other things, the woman talks about her disenchantment with God. I know from your recent blog posts that this is something you share with this character. If you knew that God existed, what would be three questions you would like to ask of him/her/it? If you are so powerful why are you so passive? Why all the obvious hoopla 2000 years ago—and nothing since? Why don’t you speak when spoken to? [PDD: While I’m sure some would be inclined to attempt to answer these questions for you (as I’ve seen them do at your blog… myself included), I think you have hit the nail on the head as to the sentiments of many people who are struggling with their belief in a Christianity-based deity. Would you care to comment on any of Penelope’s responses? Or just say “hi”? And don’t forget to check back next Friday for a little taste of Mexico. I always like interviews because I feel like you get to know an author beyond just their tweets, blog or Facebook page. Glad you enjoyed it. Thanks for stopping by. I love your blog and interview style. Really like your book so far Paul–I am a huge fan of flash and yours is so good! Hey Penelope, it was my pleasure. Enjoyed “talking” with you. And thanks for your kind words on my Free Five. They’ve all been fun to write, and I enjoyed putting together the afterwords for each one. And I’m looking forward to getting started on Absorbed. I got sucked into the ending of The Book Thief and haven’t been able to look at anything else the past week. Career ADD. That’s awesome. Thanks for stopping by Stacey. I’m usually a one book guy, too. Some weird side effect of the Kindle, I think. I do like sorbets, Italian ices, Little Jimmie’s, snow cones and sherbert…can I stay? Yes, interesting stuff! I do want to hear the rest of the story about having your notebook ravaged in 5th grade, Penelope. Were you exiled for a while? Hey Marie, I was kind of wondering that as well. I wonder if leaving it at school was an accident. And was it eating away at her young 5th grade mind to wonder if it was safe at school? Has the makings of a pretty good grade school story. Love the Harriet the Spy beginning, Penelope! And thanks for the book recs. We have a lot of the same taste–and I will check out DON’T GO INTO THE WOODS. Great 7 Q&A! Hey Jenny, thanks for stopping by. Glad you enjoyed the interview. And yes, it was nice of her to give us so many more recommendations. Hope you have a good weekend. Great questions and answers! I particularly love Penelope’s statement about the power of words. How true that is. I’m like Stacey in a way: I read one book at a time, but I also read others for reviews or for advice. Yeah, I know, but sometimes, Paul, people actually ask me things. Yes indeed. It’s why I’m very careful with my words, especially when I’m speaking. Unfortunately, there’s not much of an “edit” function for spoken conversation. I usually let the written word handle my conversations. It’s USUALLY safer. Always a pleasure to read more about a writer I admire! Great interview! Thanks for stopping by, Erik. Yeah, she’s pretty cool. Glad you enjoyed the interview. I’ve been waiting for Penelope’s review, and it did not disappoint! Penelope, my sense is that you are a very private individual, yet you manage to combine being very open and honest with a a well-protected inner self. Is that how you see yourself? It’s interesting to think of both Penelope and Paul in office jobs. Headhunter?! I guess I think of you both writing and then writing some more. Reminds me of an article I read about T.S. Eliot working in accounting in a bank! It’s always odd to think of a writer doing non-writerly things. But makes them more human, and almost all of my closest friends are human, so that’s cool, too. Thanks, Paul, for yet another awesome author interview! Hey Aniko, good observation about Penelope. I’m also wondering if that’s how she envisions herself. And we writers have to do whatever we can to support the habit. I actually almost went to Honduras to build houses after I graduated from college, but the staffing company made me an offer I couldn’t refuse (which was a decent paying job in Missoula, Montana… something not easy to come by). Worked there for awhile actually. Liked the rewarding feeling of finding work for other people. Then I went back to carpentry, something which allowed me to travel. Teaching has alternately been the best and worst job for a writer. You can’t beat having summers off. However, there is a lot of “homework” for teachers, too (grading, essays, lesson planning, etc…) So considering that, there’s definitely an advantage to a more physical job that you can leave at work at the end of the day. About how I see myself….hmmmm…I really have to think about that!! I don’t think about it much. I TRY to be open and honest…don’t know if it always works…YIKES! You might be right!! 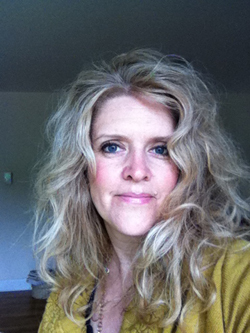 So you can be a writer AND a therapist…very insightful! Hey, you two! I love it when I can say hi to two buddies or more in one post. It’s totally awesome! As soon as I can crawl out from beneath this TBR pile, I plan to get my hands on that 100 Unfortunate Days book. It really sounds amazing. I’m sorry, what? A question? Hmm? Oh! Yeah, who’s this Paul Dail guy you’re reading? And I can understand the TBR pile. Last post I was saying how the Kindle has sucked me into multiple stories at once, but the past couple of weeks, I haven’t been able to read anything but The Book Thief. And the days have been a little longer than usual, so I only get about 20 minutes for reading. I also have this other story by some guy by the name of Garcia that I need to get to. Thanks again. This interview has been great fun.